The flowers bloom, birds chirp, the sun shines down in all its glory – summer is just around the corner! While the season invokes different emotions in different individuals, we are sure there is something that you all agree upon. That’s the reason I just created this Intex Challenger K2 Kayak insight article to uncover most special inflatable kayak in this summer. There is nothing like being in or close to the water during this season! Some like to lounge by the pool or relax by the beachside… for those who are more outdoorsy, kayaking is a fun opktion! As you kayak on a calm river or lake, you can relax and leave your stress and day to day worries at the shore. Of course, not only is this is a good way to spend your summer weekends, but this activity also gives you the opportunity to bond with your loved ones! Looking for Fishing kayak? Try New Sun Dolphin Excursion 10 fishing kayak Review. Having been in business for over 40 years, Intex products adhere to strict design principles that cater to provide safety to the users of their products. The Intex Challenger K2 Kayak is tested rigorously to ensure years of safety and satisfaction. The product is a bright green colour with sporty graphics that makes it highly visible in the water. It is important to make an informed decision during the purchase of any product. Listed below are some pros and cons that you should keep in mind for the Challenger K2 Kayak. – Rugged: Users are usually wary of inflatable boats mainly due to the high risk of getting them punctured over rocks in the water. The Intex Challenger K2 Kayak is made of tough vinyl which makes it puncture proof and less susceptible to UV rays. 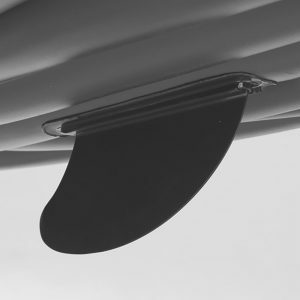 – Repair Kit: Should you manage to inflict some damage to the kayak, there is no need to stress! The package comes along with a repair kit with easy to follow instructions that should get you sorted in no time! – Stability: It will take a massive effort to get the K2 kayak to capsize! 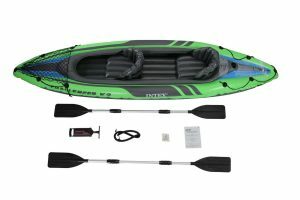 Intex has included an I-Beam support that adds stability and gives the kayak its 350-pound weight carrying capacity which should suffice for two people and their gears. – Sporty colour and graphics: This aspect is common in Intex products! The bright green colour stands out in the water and is easily identifiable in case of emergencies! 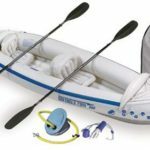 – Quick inflation: The inflation pump is easy to use, and you can have the kayak ready in less than fifteen minutes. This makes the Challenger K2 Kayak an easy tow for a quick getaway! The easy inflation/deflation also makes this gear an ideal purchase for those who are constrained for space. 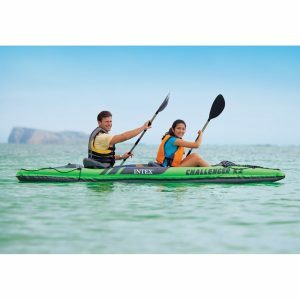 – Ideal Starter Kayak: With all its user-friendly features, th K2 Kayak is a steal for the amount you pay! – Incompatible oar sizes: The quality of the oars is below par, and it is recommended that you get replacements that have adjustable lengths for more quality usage of the kayak. – Usage only on slow rivers/lakes: If you are an adrenalin junkie then perhaps this is not the best buy for you. Even with slightly faster currents, the two individuals on the kayak will have to double their efforts to get a forward momentum. For a beginner, the Intex Challenger K2 Kayak is the perfect balance of value and features. If you fall in this category, we recommend you purchase it immediately before the summer’s over! For more Used Kayaks For Sale keep visiting our blog 🙂 Happy Kayaking! 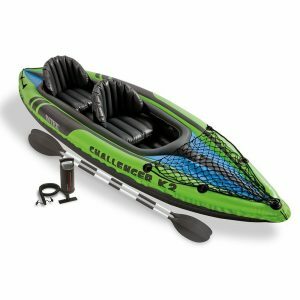 Intex Challenger K1 Kayak Review | Find best Kayak For You!